If you’re like most computer users nowadays, you probably have multiple applications up and running at the same time. In an effort to “multi-task” it is often be hard and hectic to minimize and open simultaneously multiple windows. (chatting apps, word processor, web browsers, or email clients). 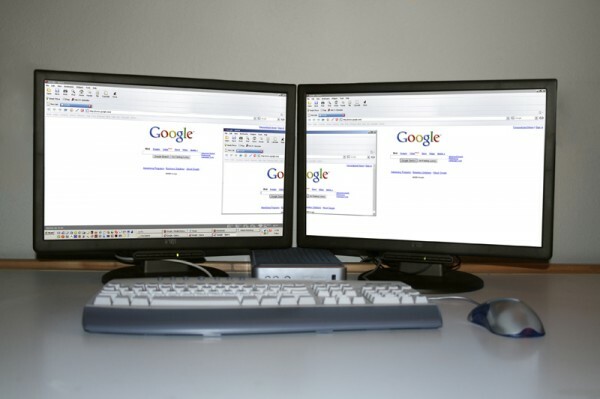 Although buggy virtual desktop programs are available, one easy solution is using multiple monitors to create an extended desktop. What is an extended desktop? As the picture above shows by connecting two monitors to your computer, you the user will now have ability to simply drag a window from one screen onto another. Now not only is it nicer to have to fully maximized applications, but it is also a lot more efficient because more room is available to get work done. Setting up multiple monitors isn’t too difficult either; getting the advantages of a second monitor is actually a lot easier than most people think. Two Monitors – Although it looks more consistent having two same monitors, two duplicate ones are not required. In fact the monitors can be of different sizes (30″ and 15″), resolutions (1024×768 and 1280×800), and types (LCD and CRT), it will still function. For the purpose of this tutorial and because ~95% of computers are running it, we are using WinXP. However Multi Monitors can just as easily be setup on most operating systems including Mac OS X. Video Card – Almost all video cards sold by ATI and NVIDIA today have two output slots (aka heads). If you currently only have one output slot, either purchase a second compatible video card or a replacement which has two outputs. 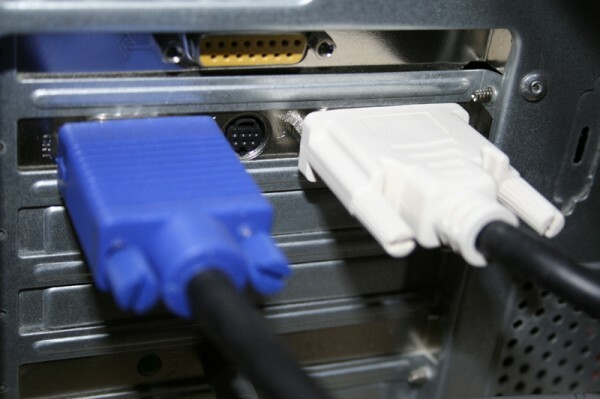 Note: For basic usage such as web surfing and email, a combo between a DVI and a VGA output won’t be an issue. However if you are a heavy duty gamer or video editor, I suggest getting a video card that has two DVI outputs. Turn off your desktop and plug in the second monitor into an available head slot. Once plugged in, startup your machine and continue to proceed with the following steps. Note: The following procedure will work for most persons; however slight modifications to the procedure may be necessary for certain individuals. After applying the settings your second monitor should now rather be an extra screen instead of a duplicate image of the contents on you main display. You should now be able to drag any window from your main screen right off the edge onto the second display. I also recommend dragging around the two monitor icons found in the Display Settings to match the actual physical positioning of your two monitors. Multiple Monitors will also work for laptop users. Just plugin a monitor into your laptop’s video output. Place your laptop besides the secondary monitor. Then to set up just follow the same steps 1-4 given above. P.S. If you have any questions please feel free to contact us through the comment below. This is also the first post by our new author Tim Severeijns. We hope you liked this tutorial. I am sure running two monitors as I do, one for TV and one for other things such as MSFS 2004 that the second monitor uses some display card memory even when TV not on. How can I shut down the 2nd monitor temporarily? I notice under hardware that my Radeon X300 card is divided into two parts. The MSFS after awhile minimizes unexpectedly. Or maybe some process starts that causes this to happen? There is no super easy way of simple disabling the secondary monitor quickly, but if you head over to the control panel, click on Display, and under the settings tab you will find some options. Click on the blue monitor icon for the second monitor to bring up the options for that monitor. Towards the bottom it should say “Extend my Windows desktop onto this monitor” — it should be checked. Go ahead and uncheck it to disable the second monitor. You will now only have one monitor active. To reactive monitor two, follow the same steps as above, but check the box this time. You are correct in that the display adapter for the graphics card is split up into two components; this is due to the second monitor. For every monitor that is active on your system, Windows will add an adapter profile. This is nothing to worry about. I am using dual monitors, xp sp2 and office 2003 on a laptop. However, when I open up 2 excel sheets they can only be displayed on one or the other monitors. I need to have one sheet on one display, and the other sheet on the other display. What am I missing? After playing around with Excel for a few minutes, I think that I’ve got the answer for you. I assumed that you opened up two documents while you were already within the application. That is, I assumed that you opened Excel and then hit the open icon, select a document or two and clicked open, right? If this is the case, then what happened next was that both document opened with the same main application window. Even though your tray showed two instances of Excel, both documents ran within the same window — Excel behaves differently than Word in this regard. If you would like to see this for yourself, minimize the document windows within the actual application, and you should see both documents there. To open up to two files and display them on two different monitors, you’ll have to open up Excel twice. To do so, click on the Excel icon to open up one instance of the program, then go back to your desktop, assuming that that is where you have the application icon, and click on it again to open up the second instance of the program. Now you should be able to open up the desired documents in the two separate instances of Excel, and place one on the left monitor and the other on the right. I had the same problem, in regards to the dual monitor on excel. I used the explination to fix the problem, but I was hoping you could help out again with a problem that stems from this solution. I would like to be able to use cells from one screen in formulas for the second sheet on the other screen. With two different excel operations running it will not allow me to do so, when if I used multiple workbooks on a single screen it would. Is there a solution to this? Unfortunately, I don’t think that this is possible, since both instances of the program are completely independent from each other. Open a single instance of Excel 2003. Create a new spreadsheet. Maximize the main excel application window across both monitors (or just stretch it across with excel un-maximised). Now go to the ‘Window’ menu at the top of the main Excel window and press ‘New Window’. This will create a duplicate window for the current spreadsheet which you can now drag across onto your second monitor. If you wish you can now go to ‘Sheet 2’ of the current spreadsheet and now you can freely reference between the table on your left and right monitors. Thanks William (and everyone else for raising a common issue) for the elegant solution to my problem – I have an excel based event management system that I wanted to add a second display to show what was happening in several areas and display to the public. I wanted to be able to seemlessly manage the program while the external monitor displays the updated information. You’ve made my day! I called Adobe tech support and asked if it was possible to use Ad Photoshop Elements 6.0 to simultaneously display different photos on different monitors. They agreed that palettes (e.g., the layers palette) could be placed on a second monitor. However, the technician said it was not possible to place different photos on differerent monitors. Too bad. If it could be done, it would have been nice. For example, one could copy from one photo on one monitor, and paste onto a second photo on a second monitor. But according to Adobe, Ad. Ph. El. 6 cannot do this. Even if the monitors have the same resolution, the technician said different photos couldn’t be placed on different monitors. But sometimes a call-up technician is wrong. What do you think? Before I buy a second monitor, I’d like to know. monitors. I have new computer and vista. how do i do this. ?? I have a desktop with WinXP Pro and an Nvidia GeForce 8400 GS card set up with dual monitors in dual view. It works fine. I want to change it to clone view with my primary monitor and tv. When I try to change to clone view, both of my monitors go black and my computer is still running. I even tried cloning with both monitors rather than the tv with the same result. After this, all I can do is a hard restart. After my computer restarts, only the primary monitor is displaying and it says my computer does not have dual monitor support. The only way I can correct this is to perform a system restore. Extremely frustrating. Can anyone help me with this?